We, as a socially & environmentally responsible company believe that small changes can lead to a big impact. As a part of our ZERO WASTE INITIATIVE, Kishor Exports always strive to find an eco-friendly & sustainable method to upcycle the leftovers to create intricate, beautifully designed products. Our production facility is audited & certified by UPMADE- an organization that enables us to apply the industrial upcycling method. Upcycling is in fact the process of creating something new & usable from the unusable. It is the best use of available materials to reduce waste and resource consumption by creating a product with a higher value from waste or byproduct streams. It uses the existing resources to improve upon the original ones. The process requires a considerable amount of creativity and vision, as well as a foundation of thriftiness and environmental awareness. The end result is naturally a product or item that is one-of-a-kind, handmade and sustainable. 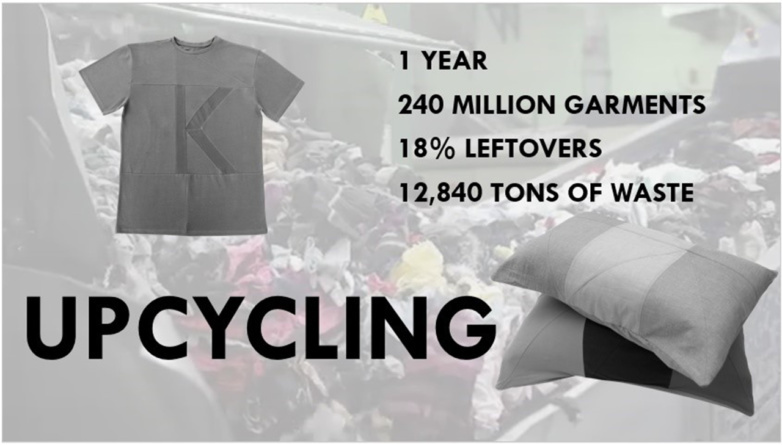 –Sustainable: Upcycling reduces the clothing and textile waste by reusing dead stock or gently used fabric to create new garments and products. It saves gallons of water that is required to manufacture a new garment & it can divert a large portion of textile waste that ends up in landfills. –Cost Effective: Similar to reducing waste, upcycling is also less expensive since used or pre-existing materials are typically a fraction of the cost of newly-made materials and textiles. –Creative: Upcycling requires creativity to envision the potential of existing materials to create something new and beautiful.